The aim of this work was to estimate the biodegradation of a poly(lactic acid) polymeric material by the actinomycetes Kibdelosporangium aridum using a vermiculite based inert solid medium which could simulate compost medium and enable us to achieve complete carbon balances. The mineralisation rate at the end of the test was compared to those obtained for two basal media. It was shown that cumulative mineralisation after 45 days of degradation was greater (70%) in vermiculite with a basal medium containing gelatin than in vermiculite with a basal medium containing glucose (20%). 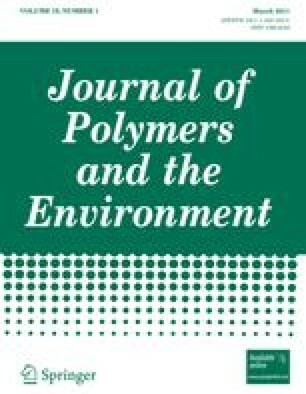 Due to environmental concern caused by plastic storage, degradable polymers are of growing interest as an alternative to traditional degradation-resistant petrol-based polymers. In terms of polymer compostability, degradation is assessed as the proportion of carbon originally present in the polymer that is converted into carbon dioxide, but generally disregards the proportion of material remaining in the medium or transformed into biomass. As compost is a very complex medium, containing various chemical compounds and biological species, determination of a complete polymer degradation carbon balance is practically impossible. Likewise, determining the role of each biological species in the compost during polymer biodegradation is extremely difficult. Recently, some researchers have introduced novel degradation tests based on an inert mineral solid medium  to deal with the problems and restrictions inherent to degradation tests in compost. These kinds of supports were used to reach enhanced repeatability, to avoid priming effects  or for quantitative and qualitative recovery of potential toxic by-products released during the degradation process. In a previous study, we developed a model compost medium based on the use of an inert solid medium composed of vermiculite  that allows for the accurate determination of the complete carbon balance . Several authors have reported that microbial degradation of PLA is facilitated by actinomycetes of the genus Amycolatopsis [5, 6, 7, 8, 9], whereas others have found that actinomycetes play an important role in polyester degradation . In this work, we use Kibdelosporangium aridum as the sole strain to gain additional information on the microorganisms involved in the biodegradation of PLA. Particular attention was paid to the evolution of some physico-chemical properties of the non degraded PLA material, and determination of the PLA degradation carbon balance. PLA pellets were purchased from Cargill Dow. Before carrying out the degradation tests, the pellets were cooled in liquid nitrogen and crushed into powder in two stages (first with a 1-mm sieve, followed by a second grinding with a 0.5 mm sieve) using a rotor crusher (Retsch ZM 1000). The powdered PLA had a glass transition temperature of 61 °C and number-average molecular weight, Mw 195.4×103 g mol−1. Kibdelosporangium aridum (Japan Collection of Microorganisms, ATCC 39323) was grown on basal medium containing (per liter) 100 mg yeast extract, 200 mg MgSO4·7H2O, 100 mg NaCl, 20 mg CaCl2·2H2O, 10 mg FeSO4·H2O, 0.5 mg Na2MoO4·2H2O, 0.5 mg Na2WO4·2H2O, 0.5 mg MnSO4, 1,600 mg K2HPO4, 200 mg KH2PO4 and 1,000 mg (NH4)2SO4 (pH 7.1). Our automated degradation test bench consists in ten 2-L glass bioreactors (CMF 100, Chemap, Switzerland). The temperature was controlled by double-wall water flow. The airflow in the reactors was adjusted to 0.56 L min−1 by a rotary ball meter KAG 1398 (Brooks instruments, Veenendaal, The Netherlands) and is CO2-free thanks to an online CO2 remover (CO2RP140, Domnick Hunter, USA). This allowed the maintenance of aerobic conditions and permitted assessment of the percentage of CO2 produced (scale 0–2%). Gas flow was measured by a mass flow-meter (5850 Tr, Brooks instruments, Veenendaal, The Netherlands). CO2 emissions from the bioreactors were measured automatically every other hour by an infrared gas analyser (Binos 120 M, Rosemount, France). An automated acquisition system (Allen-Bradley, Millwaukee, Wisconsin) was used to transfer data to a computer (Rsview 32, Rockwell Software, Velizy-Villacoublay, France). The final quantity of CO2 produced was calculated by integrating the CO2% and the gas flow for the sampling time (12 min). Each bioreactor is composed of a bed of vermiculite (180 g Vermiculite, Grade No. 3; Sigma–Aldrich), 315 ml of mineral solution, 110 ml of culture media of Kibdelosporangium aridum. The mineral solution is buffered at pH = 7.1 with 0.1% (w/v) glucose (Test #1) 0.1% gelatin (Difco) (Test #2). Tests were initiated by adding 15.5 g of PLA, containing approximately 7.7 g of carbon, to the reactor. Each reactor was shaken every other day and the test temperature was maintained at 58 °C. The degradation tests were conducted in triplicate and were monitored for 45 days. Although CO2 was removed from the air entering each reactor, an empty “blank” reactor was included to determine the quantity of carbon dioxide present in the inlet air flow. The protocol for extraction of the degradation by-products and carbon quantification is summarised in Fig. 1 . Starting with a frozen sample, two 4 g samples were dried at 105 °C for dry wet determination. One 4 g sample was then homogenised in 30 ml of Ringer solution for 40 min. After centrifugation at 10,000 rpm for 20 min, the supernatant was filtered and submitted to dissolved organic carbon (DOC) analysis. The residue (R) was dried in an oven for 2 days, weighed for dry weight determination, was and then ground and submitted to elemental analysis (TOC 5000 Shimadzu). The second 4 g sample was placed in a known volume of NaOH solution (0.025 M) and homogenised in an oven at 70 °C for 48 h. As a result, the ester bonds of the residual PLA were totally broken, releasing lactic acid into the solution. This solution was filtered and the lactic acid content determined using HPLC. HPLC analyses were carried out using an Aminex HPX 87H column, 300 × 7.8 mm (Bio-Rad, Ivry/Seine, France) maintained at 35 °C. The mobile phase (0.02 mol/L sulfuric acid) was degassed by passing through a 0.2 mm pore size filter and a flow rate of 0.6 mL/min was maintained at 900 psi pressure. Lactic acid was measured using a UV detector (TSP 8880, Les Ulis, France). The injection volume of sample was 20 mL. Prior to injection, the samples were filtered through 0.22 μm pore size filters (Millipore Corporation, USA). Three filtered solutions corresponding to three replicated experiments were combined. A calibration curve was established beforehand using different concentrations of lactic acid (Sigma Chemical Co., Saint Louis, Missouri). For each test, we performed extractions of the non-degraded PLA material in order to follow the change in molecular weight and glass transition temperature. We proceeded as follows: 4 g of frozen sample were homogenised in 30 mL of Ringer solution for 40 min to eliminate soluble by-products (the homegeneization time was kept sufficiently short to avoid chain scission by hydrolysis). The solution was then filtered through a cellulose acetate membrane (porosity: 0.2 μm) and the solid phase dried at 60 °C until the weight remained stable (this drying step was performed at low temperature to avoid any thermal degradation). The residue was then placed in 30 mL of chloroform for 10 min to dissolve any PLA remaining in the sample, centrifuged at 10,000 rpm for 20 min to remove the bulk of the mineral medium. The supernatant was placed in a syringe and filtered (0.2 μm, Millipore, USA) for solvent casting in a Petri dish. After solvent evaporation, the recovered PLA was used for Size Exclusion chromatography and Scanning Calorimetry determinations. Gel permeation chromatography (GPC) testing of PLA film samples was performed using a Thermo Separate products model 300 (les Ulis, France) high-performance liquid chromatography. Tetrahydrofuran (THF) was pumped at 1 ml/min and an injection volume of 200 μL was used for HPSEC analysis. A PLA sample of 0.1 g was dissolved in 5 ml of THF. A refractive index detector (Shodex RI 71) was interfaced to PIII personal computer. A PL Caliber logiciel and interface PL-DCU (Polymer Laboratories) enabled chromatograms to be numerically recorded. The Plgel 5 μm MIXTE-C column (Polymer Laboratories) was used. A molecular weight calibration curve was constructed based on ten narrow-molecular weight-distribution polystyrene standards (Easical), with Mw peaks ranging from 580 to 7,500,000 gmol−1 DSC analysis were performed on a TA-Instruments M-DSC apparatus (USA) with approximately 12 mg of PLA. First, the sample was equilibrated at 0 °C for 3 min, heated (10 °C/min) and stabilised at 180 °C for 2 min. Then the sample was cooled to 0 °C at 20 °C/min and maintained at this temperature for 5 min. The final step was a heating ramp at 10 °C/min to a temperature of 200 °C followed by a return to room temperature. The glass transition temperature was determined in the second heating step. Figure 2 shows the mineralization curve for PLA degradation in the inert solid medium for Test #1 [liquid basal medium with 0.1% (w/v) glucose]. The cumulative mineralization (Cg) after 45 days of degradation totaled about 14% and the carbon degraded reached about 20%. In order to enhance the inert solid medium mineralization curves, we modified the biochemical parameters of the medium changing the composition of basal medium and replacing glucose with gelatin. As a result, the cumulative mineralization obtained after 45 days was 60% and degradation was about 70% (Fig. 3). We also observed a larger decrease in the Mw of the residual PLA during Test #2 than Test #1 (Fig. 4). Indeed, the Mw decreased by 18% in Test #1 (i.e., from 195.4 × 103 to 160 × 103 g mol−1), and by 87% (i.e. to 25 × 103 g mol−1) during Test #2. During the first 10 days of the test exposures, water-soluble degradation products are to slow to be released, but then increase significantly (Figs. 2, 3). This effect was more pronounced during Test #2, peaking at about 17% of the total polymer-C (Fig. 3) against 2.6% during, Test #1 and corresponded to a decrease in molecular weight of the residual PLA (Fig. 4). Soluble, low molecular weight oligomers released into the degradation medium from the polymer matrix via microbial hydrolysis are subsequently used by the micro-organisms, leading to the production of additional carbon dioxide and new biomass. Consequently, the water-soluble carbon pool also decreases. Biomass production (Cb) peaked at about 21% during Test #2 (Fig. 3), versus only 5.6% during Test #1 (Fig. 2). During the degradation tests, biomass production exhibited a lag period of about 6–10 days, followed by a 10–14 days period of rapid increase, after which biomass production slowed considerably. Following the lag period, during which time the micro-organisms become adapted to the medium, the period of rapid biomass production most likely reflects degradation of short PLA oligomers produced during sample preparation (i.e. grinding) and which are immediately available to the micro-organisms—corresponding to an increase in lactic acid released into the medium (Fig. 5). The chain scission indicated by the SEC data also has some consequences on the evolution of glass transition temperature. During Test #2, the Tg decreased from 61 °C to approximately 58 °C at Day 10. This would result in enhanced water absorption in the polymer matrix and, in turn, promote the biotic chain scission reaction and the diffusion of soluble, PLA oligomers into the degradation medium. A similar decrease in Tg was not observed during Test #1 because abiotic degradation was too weak. The value of carbon balance for the degradation of PLA for the test #1 is about 44% (±8) and 103% (±9) for test: #2. The standard deviations are of in inaccuracies added by every measures. On the other hand the difference of degradation can explain by difference of production of enzymes which can cut the PLA and what it would be interesting to characterize. The utilization of vermiculite as an inert solid support for degradation testing allowed us to thoroughly investigate the degradation process of PLA. A carbon balance was developed, and though the total of carbon recovered was not exactly equal to 100%, the accuracy of the method was sufficient. The utilization of an inert solid medium allowed us to emphasize the biotic degradation of PLA in a solid medium. In this respect, major modifications did not involve the extraction protocol but rather the degradation medium itself, notably the composition of liquid basal medium. With regard to biodegradation in different media, total mineralization for the PLA material on an inert solid with basal medium containing 0.1% (w/v) glucose (Test #1) was 20%; degradation with a basal medium containing 0.1% (w/v) gelatin (Test #2) totalled 70%. Based on these values, we concluded that Kibdelosporangium aridum was capable of biodegrading these PLA materials in the basal medium used for Test #2. These results indicate that this assay can be used to compare the biodegradation of PLA by different microorganisms. That is, we can gain a better understanding of polymer biodegradation by comparing the different terms of the carbon balance and by analysing the basal medium for the enzyme(s) involved in biodegradation.